Blockbuster Stores in the UK was handing out fliers which indicated the release of upcoming games. 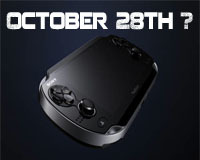 And along with that it also revealed a release date for the Sony PS Vita which was October 28th 2011. which is quite soon. and nowhere near the "Christmas Release" everyone was suspecting. All this evidence can maybe prove that the Sony PS Vita will be arriving in stores a bit sooner than you think!